Soil salinity is an important stress factor that limits plant growth and productivity. For a given plant species, it is critical to sense and respond to salt stimuli followed by activation of multitude of mechanisms for plants to survive. Halophytes, the wonders of saline soils, have demonstrated ability to withstand and reproduce in at least 200 mM NaCl concentration, which makes them an ideal system to study mechanism of salt adaptation for imparting salt tolerance in glycophytes. Halophytes and salt sensitive glycophytes adapt different defense strategies towards salinity stress. 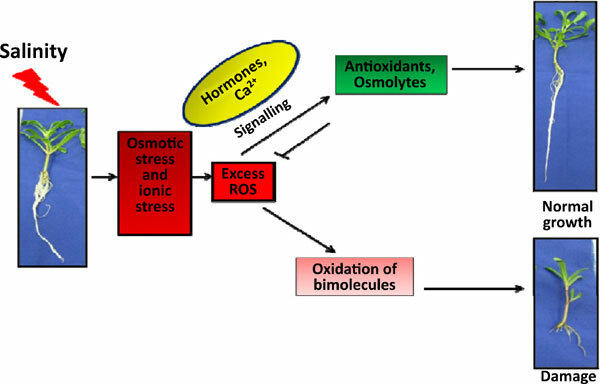 These responses in halophytes are modulated by a well orchestrated network of signaling pathways, including calcium signaling, reactive oxygen species and phytohormones. Moreover, constitutive expression of salt stress response related genes, which is only salt inducible in glycophytes, maintains salt tolerance traits in halophytes. The focus of this review is on the adaptive considerations of halophytes through the genomics approaches from the point of view of sensing and signaling components involved in mediating plant responses to salinity. Keywords: Halophytes, Salinity, Redox homeostasis, Genomics, miRNAs, Hormonal regulation. Keywords:Halophytes, Salinity, Redox homeostasis, Genomics, miRNAs, Hormonal regulation. Abstract:Soil salinity is an important stress factor that limits plant growth and productivity. For a given plant species, it is critical to sense and respond to salt stimuli followed by activation of multitude of mechanisms for plants to survive. Halophytes, the wonders of saline soils, have demonstrated ability to withstand and reproduce in at least 200 mM NaCl concentration, which makes them an ideal system to study mechanism of salt adaptation for imparting salt tolerance in glycophytes. Halophytes and salt sensitive glycophytes adapt different defense strategies towards salinity stress. These responses in halophytes are modulated by a well orchestrated network of signaling pathways, including calcium signaling, reactive oxygen species and phytohormones. Moreover, constitutive expression of salt stress response related genes, which is only salt inducible in glycophytes, maintains salt tolerance traits in halophytes. The focus of this review is on the adaptive considerations of halophytes through the genomics approaches from the point of view of sensing and signaling components involved in mediating plant responses to salinity.